1. Revell are selling their 1:72 NH90 kit #4403 in Finland with speculative Finnish Army decals. The kit is packed in their standard box and also includes the regular decal sheet. If anyone wants one, please contact Martti Kuivalainen. What did the Soviets do with their old, left over Avro 504K trainers in the 1920s...turn them into autogyros by getting rid of the top wing! Both kits are based on the Avro 504K trainer (with much smaller lower wings) but with a four (paddle style) bladed rotor mounted on top. The KaSkr-1 has the same type of 'cowled' rotary engine as the '504K', while the KaSkr-2 has 'open' style Titan 250 hp radial engine as well as different shaped wings...it also comes with skis (wheels are included but aren't an option). The KaSkr-1 kit has decals (for one aircraft)....the KaSkr-2 doesn't. 3. A number of kits are appearing from China under the 'Kitech' label. Apart from the name, the packaging is identical to that used by Zhengdefu, so that's presumably a clue to their contents - dubious Italeri 'clones'. 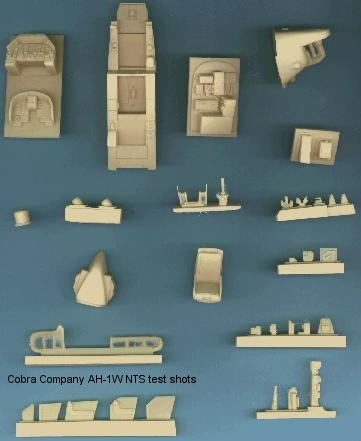 The 1:72 Hind-F, MH-53E, Tigre PAH-2 and Tiger HAP have been seen in these boxes, there are probably more. 4. NightFlight Models, who are working on a 1:35 Pave Low, say that they intend that the kit will be available in October 2003. 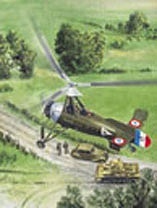 A number of 1:35 and 1:48 US Helicopter Crew sets are also listed but not yet available. 5. US (Vietnam era) Helicopter pilot figures in 1:48 are available from Propaganda Kompany, as are an interesting selection of other figures and accessories. 6. Cobra Company's 1:35 AH-1W AH-1W NTS (Night Targeting System) resin conversion #35009 for the Academy/MRC/Italeri kit is almost ready for release. This picture (below) shows test shots - note that there will be more than one of some of these parts in the full set. 7. Eduard's February releases include #32-091 photo-etched AH-1W/T Super Cobra armament (above). This is also designed to be used with the Academy/MRC/Italeri kits, I'm not sure why they think the kits are 1:32. 8. 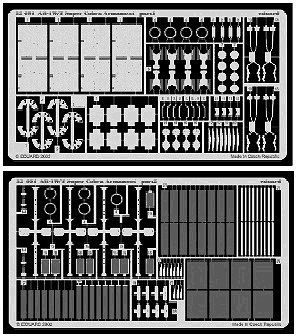 Model Alliance have revised their 1:72 Australian Army Chinook decals. These now come with full stencils and new instruction sheets. Following their imminent Sea Kings, the next helicopter sheet will be Test Squadrons and should include another Sea King plus a Lynx. They are also looking at an RAF Chinook sheet for mid 2003. 9. Landing Zone have published their first book "US. Navy Seahawk Family" by Philippe Dognon and Christian Bouschon. This covers the SH-60B, SH-60F, and the HH-60H in 40 A4 colour pages. For the first time, a book has been written fully detailing the history of the French-built machines, after the license of Cierva and Avro. The machines built by LйO were used both the Armйe de lґAir and the Aйronautique Navale. More than 250 photos illustrate the book with the usual colour profiles and scale drawing. I understand that Profils Avions #6, due for publication soon, will cover the Super Frelon. 11. One of HKN's readers has recommended another book that was published in April 2002 but hasn't been mentioned here before. This is Rescue Pilot by Dan McKinnon, and it tells the story of SAR work with the USN's HU-1 when they were flying HUPs. Thanks to Martti Kuivalainen, Gary Madgwick, Dave Fleming, Jeffry Fontaine, William F. Beasley (NightFlight), Chris Miller (Cobra Company), Drew Graham and Tony Morgan.